Amanda Neely founded Overflow Coffee with her husband, Brandon, in the South Loop. Both Amanda and Brandon Neely always dreamed of finding their destiny and looked to the future. And they found it in a coffee bar. The South Loop residents were on a different path in 2007 with Amanda working at a fundraising non-profit organization and Brandon working in the IT field. 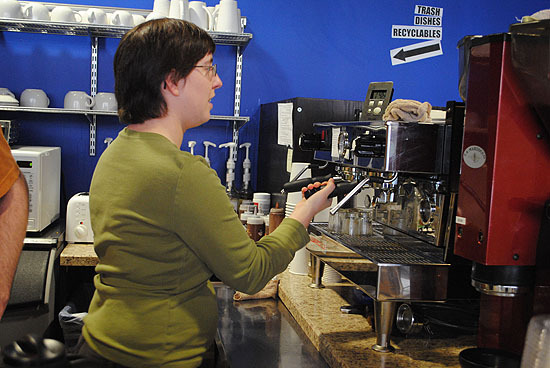 “I was getting frustrated in fundraising with how many non-profits spend so much time fundraising that they lose their mission and they’re not able to accomplish their mission and then we always dreamed of starting a coffee shop,” Amanda Neely said. Brandon and Amanda decided to pursue their coffee bar dream. In 2008, the couple went on a trip to coffee mecca Seattle, and toured various places and coffee shops to seek out advice. Later that year Amanda started an internship for three months at The Common Cup, in Rogers Park. She mentored with the owners of the shop, Ruth and John Hoekwater and learned the day-to-day business side and trained as a barista. Overflow Coffee found its home in the South Loop because it was the fastest- growing neighborhood in the nation and there were not many businesses in the area. The main reason why they decided to start there was due to the lack of a sense of a community in the neighborhood-something they thought their business could remedy. “Stereotypically speaking in regards to the South Loop being known as a rough neighborhood, 15 years ago yes it was more like that but the people who think that is true now have not been here and seen how safe it is.” Amanda said. They took their time planning and figuring out all the critical details because they did not want to make huge mistakes, they still made some but not as costly. 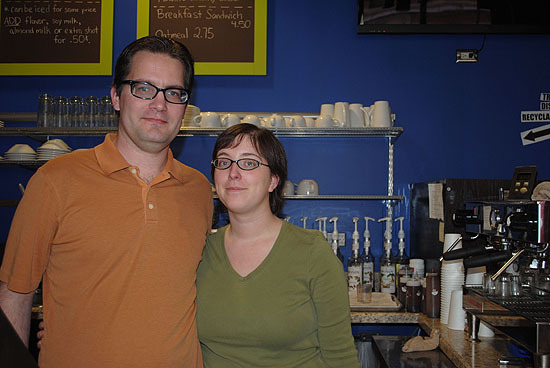 Opening a coffee shop can be daunting, especially in the current state of the economy but the Neelys made it work. It was a challenge for the Neelys to make sure not only they were taken care of but their business as well. The Neelys are advocates of making sure the farmers who grow their coffee beans are paid fairly within the fair trade. Coming up with a name for their newfound shop was fairly easy. They were reading a book called “Outflow,” a Christian book, and were discussing how people often just focus on friends and family. They equated it to a fountain, that if “we overflow that love and care to our neighborhood and then that can overflow into the city we live in and then overflow into the nation and world, it's like a multi-tier foundation” Amanda said. Their ultimate goal is to impact the community around them. The word Overflow means much more than just coffee but rather an overflow of ideas and impact. With large glass windows, wooden floors and a colorful background of a bright blue wall, Overflow is located in a building shared with two other companies. One of them is a non-profit experiential cutting-edge day school in the back of the building. Non-profit offices are at each end of the hallway, with Overflow in the center. The Neelys have partnered with some of them and when they have clients come in they provide hospitality for their clients. The Daystar Center, a non-profit community center, is another organization Overflow has partnered with to do concerts, film nights, open mic nights, a knitting and crocheting circle, and board game nights to help keep building community and neighbors meet other neighbors. Overflow also encourages volunteering within the community. The Neelys have tied a percentage of their coffee bar sales to non-profit work in the community. Amanda and Brandon make sure the coffee and other products that they use helps the farmers that grow it. In fair trade certified, someone is getting a rate set by the fair trade but might not include the farmer. The Neelys are hoping once they’re more established and making more money the way that they’re structured, they are required to give their profits to nonprofit ventures and hoping on their one-year anniversary that they can start giving 10 percent of everything people buy goes back to non-profit work. First, they want to start in the South Loop and then branch out. Customers will notice that hanging on the walls are paintings and photographs of local artists that Overflow supports by showcasing their work. It rotates on their walls and its commission free if the artist sells it, the artist receives all the profits. Customer Sam Menesses, of Bedford Park, has been coming to Overflow for a while now. Menesses’s favorite drink is The Overflow because of the cayenne. From cappuccinos to mochas to regular coffee, Overflow has everything. Food names such as “The Abraham Lincoln” and “The Jane Addams” add pizzaz to the sandwiches and other food items. Overflow receives their coffee from The Coffee Ambassadors who roast the beans for them. The people at The Coffee Ambassadors go to Guatemala or Uganda and get the beans right there. None of the coffee at Overflow is more than two weeks old. For Brandon, he now notices drinking coffee has changed his taste buds.